Pivoting is defined as the central point on which a mechanism turns or oscillates. In the discus, pivoting is executed on the ball of the foot, with the heel elevated above the ground. Without the ability to smoothly pivot on the feet with balance, any thrower will struggle to rotate or spin across the ring. There are four main phases where the discus thrower uses a pivot foot. 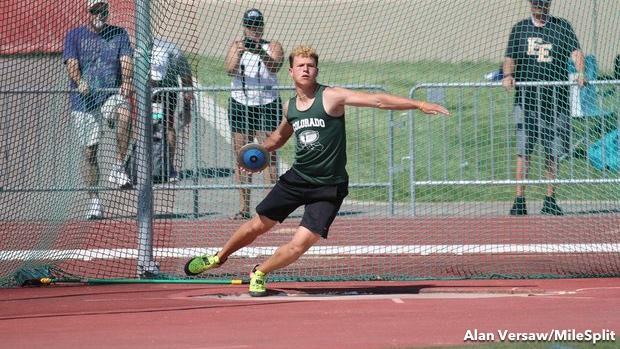 Assuming a right-handed thrower, winding up is where the discus is withdrawn back to the right in a clockwise motion. During the wind-up, both feet are on the ground, with the right foot flat and the left foot pivoting in place as the discus is wound back. The wind-up is a counter movement setting up the movement to the left afterward. 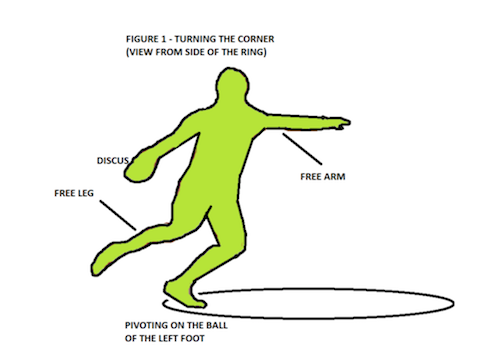 Since a right-handed thrower will rotate counter-clockwise across the ring, at the conclusion of the wind-up, the left foot reverses its pivot direction and starts to pivot in a counter-clockwise motion (toward the thrower's left). During the first half of this movement, both feet are on the ground and the body's left side turns, pivoting on the left foot as far as possible before moving the right foot from the ground. Once the right foot moves, the thrower is now pivoting on only one foot--the left--as the right leg (free leg) swings around and is cast into the middle of the ring. See figure 1. At the conclusion of the first turn, the thrower will temporarily leave the ground. 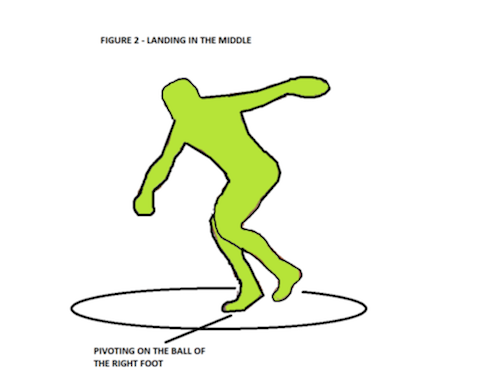 After turning the corner and pushing off from the left foot into the middle of the circle, the right foot will land and become the next pivot foot. The thrower continues to pivot on the ball of the right foot until the left foot is grounded at the front of the ring. See figure 2. Once the thrower is on both feet (double support) the left foot (or block foot) stays down, while the right foot continues to pivot as the thrower pulls the discus around and through the release. This ongoing pivot of the right foot is important because it allows the right side of the body to turn into the release without cutting hip movement short. See figure 3. Pivoting is executed on the bottom of the front half of the foot (ball of the foot). The heel should be slightly off the ground, but not excessively high. Approximately an inch up. During times when the thrower pivots with both legs on the ground (during wind-up and the delivery phase), the body's weight is distributed on both legs to differing proportions. The non-pivot foot is grounded in place. During times when the thrower pivots with one foot on the ground (turning the corner, and upon landing at the middle of the ring) the body's weight must shift to be balanced overtop the pivot foot. After wind-up at the back of the ring when the athlete turns to the left, the non-throwing arm (free arm) must be held out long, and rotate in the same direction as the pivot foot, and not ahead of it. In landing in the middle of the circle, the thrower must be careful not to land on their heel. This will stifle the rotary movement of the entire body. 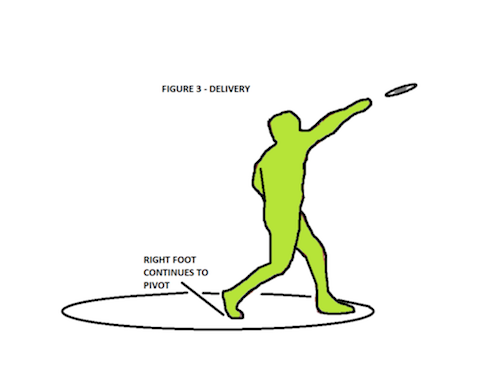 If the thrower pivots well in turning the corner, they will rotate in the air such that at ground contact in the middle of the ring the right foot will land pointed toward the back of the ring. Pivoting must immediately commence at touch-down to keep the thrower system moving. The pivoting movements in the discus mirror those of the rotational shot as well.